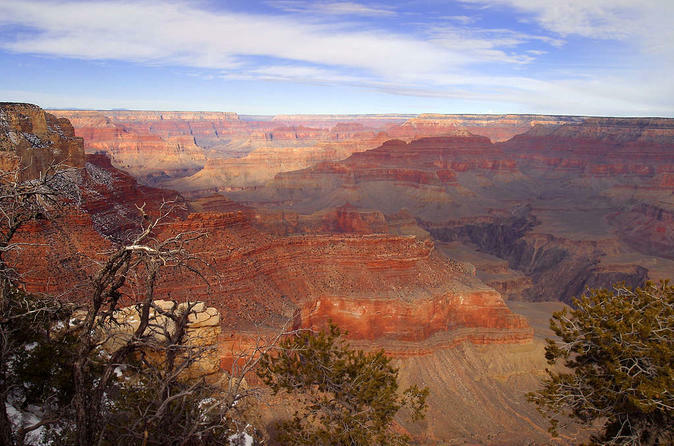 Enjoy our one day Grand Canyon Deluxe tour where you will spend quality time touring one of the “Seven Natural Wonders of the World”, Grand Canyon National Park. Your personalized van tour spends up to 3 ½ hours touring the 26 mile east rim drive. From Desert View, the location of the historic Watchtower, to Grand Canyon Village and the Historic El Tovar Hotel, your Southwest Tour’s Driver/Guide is with your group throughout the day to give you their insights of the canyon, answer your questions and put you in your pictures with the spectacular Grand Canyon as a backdrop. Your knowledgeable and professional tour guide will pick you up between 6:45 – 7:45 a.m. in a comfortable 10 passenger custom seated van. As you travel north through the Sonoran Desert and up to the Ponderosa Pine forest of northern Arizona, you will feel the temperature drop and witness the varied terrain with the changes in elevation. You will experience a pleasant mingling of American, Mexican, and local cuisine with a lunch stop on the Navajo Indian Reservation in Cameron, Arizona, just 32 miles from the East entrance of Grand Canyon National Park. Our return trip makes a brief dinner/snack stop prior to returning to your pick up location.